They say everyone has a unique story to tell, but often people, businesses and brands find it hard to get that story told in a way that is engaging. But one woman entrepreneur is on a mission to change all that. Chule Gobodo, co-founder of Brainbow Conscious Creatives, is showing clients how to powerfully connect their brands with their consumers using storytelling through film. LoA had the pleasure of meeting this creative powerhouse this month to find out more. Brainbow Conscious Creatives is the only youth, female black owned boutique creative story agency in South Africa. We specialize in using storytelling as a brand activism tool. Storytelling has the power to connect the consumer to your brand in an emotive, authentic, memorable way. We do this through branded films and story experiences. Story experiences can be anything from VR healing art experiences to live music story events. We consider ourselves as the trusted voice of African women. Through specially crafted story experiences we engage in and create an intimate relationship with this growing market. Consider us as your loving translator when it comes to communicating to the multi layered, complex and ever evolving African woman. "Storytelling has the power to connect the consumer to your brand in an emotive, authentic, memorable way." We met in film school in 2005, each of us with a dream to create an epic story. We where drawn together because of spiritual curiosity and our passion for service. We started Brainbow Productions (now Brainbow Conscious Creatives) with a desire to make inspiring, motivational films. Little did we know that we would embark on an adventure of spiritual growth, self awareness and loving relationships by starting a business together. Through the years we have evolved from a video production company to a creative story agency but one common thread has remained untethered, our mission to spread love through storytelling. The creative agency space is dominated by mostly white men. From our research and experience it is clear that there is a lack of insight on how to connect with the African woman. The stories about African women are one dimensional and lack depth. As this is a growing market, that is sophisticated and gaining spending power as a brand you have to authentically and consciously connect with them. We bring our experience as African women and our growing network and engagement with other African women as a pivot point when creating our story experiences. "Consider us as your loving translator when it comes to communicating to the multi layered, complex and ever evolving African woman." As the founders we do business unusual. We don't have a CEO, instead we have three Chief Creative Initiators. Merging creativity and technology to come up with new experiences for our clients and our consumers is paramount. Chule looks for the relationship gaps and sees what story would best create a connection between client and consumer. Mukundi finds new platforms and mediums to tell our stories ever more engaging and unusual ways. Kutlwano creates the road map of how a creative idea can be executed and visualized. "Through the years we have evolved from a video production company to a creative story agency but one common thread has remained untethered, our mission to spread love through storytelling." For us we've always known that we didn't just want to entertain, we wanted to tell stories that inspire self-awareness, reflect our spiritual growth and create loving relationships. We also wanted to create a space for others to share their story. We knew we couldn't impose that vision on an employer so in 2010 we decided to open Brainbow Productions. We started by licencing the 48 Hour Film Project, an international timed film competition where filmmakers have 48 hrs to write, shoot and edit a short film. We were the first African city producers among 150 cities worldwide. We helped over 300 short films to be produced and screened in cinemas in Johannesburg, Cape Town,Durban and Gaborone. We wanted to create a safe space for creatives to tell stories, fail, and try again. The business evolved to us creating our own content but we struggled to get our stories out there, mainly because we where trying to fit in instead of creating value. We were stuck taking on jobs we hated just to stay afloat. We got an opportunity to produce our first campaign video for the South Africa we pray for campaign. See music video here. This music video afforded us an international award for best music video at the International Christian Film Festival in Florida, USA. We thought that this award would give us credibility and would validate our worth. Fortunately for us we came back to 3 months of zero business. I say fortunately because it forced us to validate our own value. We had to decide what we wanted to be and we were prepared to start over. We got an opportunity to work on the Impossible to Possible campaign with Ariel. Ariel had lost touch with their hand wash market and needed a way to reconnect. Here was our solution Impossible to Possible. For us it was important to show that these women are more than just "mamas" they have dreams of their own and it’s not too late for them to achieve them. After this we had an ‘a-ha’ moment. The world of brand storytelling opened up to us and we decided to completely re-brand and re-position ourselves. We went from Brainbow Productions, a technical services company, to Brainbow Conscious Creatives, a boutique creative story agency. No longer were we afraid to incorporate spirituality, consciousness and business. The re-brand is a declaration of who we are. We create the same space for women that we tell stories to and whose stories we tell. 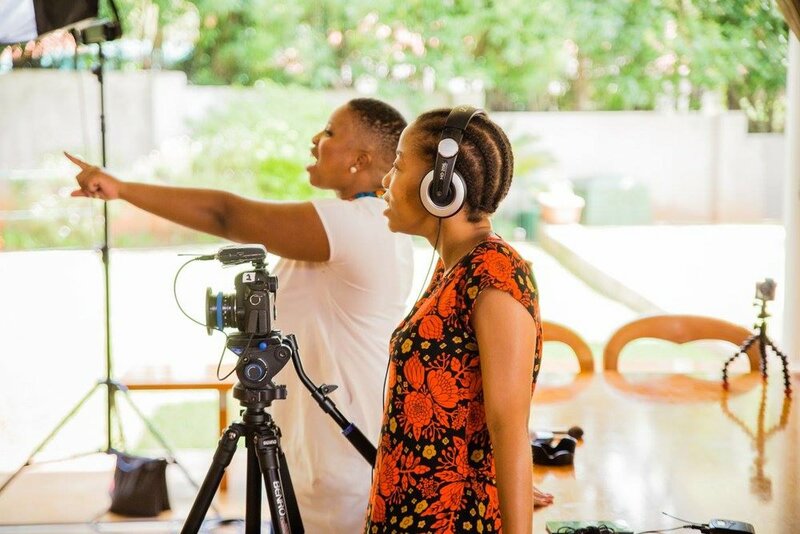 "We bring our experience as African women, and our growing network and engagement with other African women, as a pivot point when creating our story experiences." We want to use love as a disruptive tool in the market and to create a space to make this model profitable, scaleable and replicable. We are building what we call The Economy of Women. We want to create a feminine ecosystem of doing business. This evolution and growth will take on different business forms of which Brainbow Conscious Creatives will be one. We want to invest in and incorporate a multitude of women owned businesses in different sectors and create a space for them to grow, dominate and change how business is currently done. In this way we create a loving space for business. The ability to freely create. The fact that I can see a pain and create something to address it is incredible. For example in August we will be launching W.O.M.A.N, a healing story experience. This was born from the realization that I suffer from victimhood and that blindness to this crippled my ability to change my life. As I spoke to other women and addressed it in my blog, Chule the Love Activist, https://chule02.wixsite.com/chuleloveactivist and got feedback from my readers I realized no one talks about victimhood and the story that voice weaves. So W.O.M.A.N charts the feminine narrative journey from Victimhood to Victoryhood. The medium of the story can be anything from an art piece to a live event to a 4D film. There are limitless ways to tell a story and that's exhilarating. Just start. Even if you fail big that's okay, give yourself permission to fail. If you don't you won't take risks and push your boundaries. Love yourself and make sure you nourish yourself and your relationships. Your family and friends are stakeholders, giving you the space to build. Rather have over-confidence in the value you bring then none at all, the latter encourages inaction. Know your value, you are worth the risk. And lastly charge your worth, do not undercharge as it will cripple your business.